Digi-Data offers a pre-integrated VTL and utility disk system to simplify data protection and secondary storage requirements. The C-VTL is positioned for higher capacities without the excessive costs involved in other enterprise-class solutions. Digi-Data offers a pre-integrated VTL and utility disk system to simplify data protection and secondary storage requirements. The C-VTL is positioned for higher capacities without the excessive costs involved in other enterprise-class solutions. At 25 TB, it provides massive capacity for those customers that prefer to back up all of their data onto disk-based storage. The capacity is available to either leave multiple full-backup generations on disk for faster restore operations or use the native tape backup vaulting utilities to move it to tape storage. Handling multiple backup servers is no problem. Data protection utilities nearly always require very high bandwidth to move hundreds of GB in a few hours. This is where other systems struggle, due to the limitations in bandwidth of low-end or general purpose controllers. 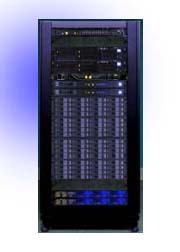 The dual controller solution can push 700MB/s to the back-end disks. This keeps backup servers moving data at full bus speed on backups or restores.